Zara Tenerife stores and my best Zara store. Zara Tenerife is tops in Santa Cruz the capital. Zara Tenerife has several stores on the island. Most are in or near the capital. But, Las Americas and La Orotava with la Villa mall have their branch as well. Yes, you can see me here by the Zara back-door in Santa Cruz. sky rise of Banco de Santander. in red from far when coming into Plaza Candelaria from the sea-side. on your right behind a slender, white marble monument called Obelisc de Triunfo de Candelaria. opposite corner of a side street. Photo of this view will follow below. Zara shops on the biggest of all Canary Islands seem to sell clothes for women, teenagers and children, only. 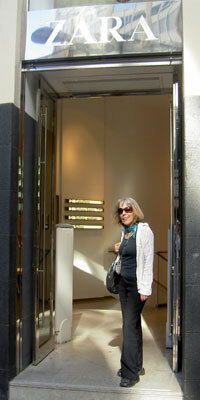 The picture shows some of the inside of the Zara shop on Plaza de Candelaria in Santa Cruz de Tenerife. First time, I saw one of Zara shops was when an insider resident introduced me to Zara's collections. On that day my lady friend and I went to Santa Cruz by car. That's what insiders like to do. 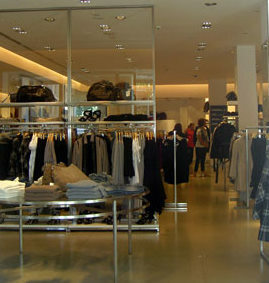 Of course, you can go to Zara Santa Cruz using Tenerife transport by bus or other means. She used the underground parking Santa Cruz at Plaza de España. Find public parking by looking out for one of the many blue parking indicators around town. Admire the beautiful panoramic photo above where you see a car driving into this parking lot. Take notice of the blue board indicating this parking facility. Also, make out the Ferry in the picture. So much is there to discover by one of most innovative world town squares. There is an exit/entrance for pedestrians from the underground parking. 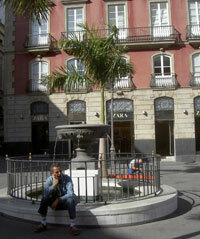 It leads to the shop Zara at Plaza Candelaria where a fenced in fountain (Pilar de Candelaria) is in front. The spot is so easy to reach because, the town squares Plaza de España and Plaza de Candelaria are connected. Almost one square, you know. I was absolutely taken with Zara at Plaza Candelaria. What's so great about this Zara store? It displays its stocks on several floors. You can take stairs or an elevator to get there. Perhaps, we were particularly lucky with the outstanding variety it had. Prices were very reasonable, too. May be, it was also a question of the light on the upper levels. It could have been the morning light which indirectly entered the store through the many windows. You can see them in the photo with the fountain above. The right, natural light can even render a store like Zara which has best advantages, already, more magic. Also, colors are always true with natural illumination. Music at Zara doesn't come into my mind but, wouldn't be that important. The artificial Tenerife lake of Plaza de Espana is a must see with the Anaga Mountains behind on the horizon. Its bar is also the ideal stop over for a refreshment on any Santa Cruz capital Zara trip. And by the way of course, you can still buy clothes there when the stars are up by the spectacular lake next door to Zara Santa Cruz. The shop closes at 10 p.m. However, make sure to arrive before 9.p.m. Zara Fashion for any age? The red Zara Denims seen in the photo were bought at Christmas 2014. The quality is still excellent after washing them many times. By the way, you would never believe the age of the lady depicted. This shows you that Zara fashion isn't only for the young. In 2009, I had Swedish girls visiting who absolutely had to go see Zara Tenerife in the south of the island. Zara Arona by Las Americas is in a real glamorous area. But, now, look at Plaza de España by Zara Santa Cruz at night. Not a bad neighborhood, either...Right? To be honest I was disappointed comparing Zara Tenerife Las Americas with my preferred Santa Cruz shop. We never got to Santa Cruz, by the way. We picked Playa de las Americas where we arrived with a rented car and got quite lost in town where one really should have a detailed road map with shops and other attractions pointed out. We started searching for Zara and eventually got to it. 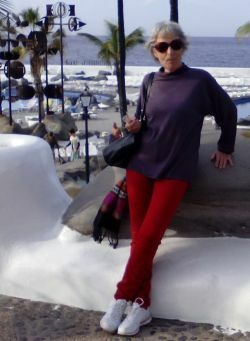 Later, I discovered that it's supposed to be right opposite Mare Nostrum which you can see at Tenerife photos Arona where Zara is also very close to the musical fountain and shop Cartier. However, I took no picture of the Zara shop, there. Note that tight Denim jeans are still the rage. Shirts accentuate the waste and the feminine figure. Pastel cotton with dainty flower motives give the romantic Zara touch. Shoes are sling strap and well visible, while trouzers stop short above the ancles. Learn more about Spanish fashion which has amazing importance for Spain's economy, while Zara and Stradivarius of the mighty fashion group Inditex of northern Spain are unfortunately not found near the 5 star Hotel Mirador del Duque on Costa Adeje. Mind that the Spain fashion designer Zara Tenerife is still celebrating youth above all else. Mini skirts go all year round. Short skirts are popular in Spain as well as on Tenerife, the island of gentle spring. Tight tops round off the summerly look of 2010. Only one shopping floor Zara on ground level. You find it at the end of the mall. Important international gift delivery at any Zara outlet. My daughter bought me a Zara Tenerife bag online in the UK. I had to collect this gift at the shop of Zara La Orotava. Why there? Because that's closest to where I live. So this gift service is international. No shipment needed, as long as the item is available at a Zara outlet near the residence of the person that receives the gift. Mind that most probably she even physically inspected the bag in the UK. I must have seen Zara in the Commercial Center in La Laguna next to Al Campo and Ikea . Anyway, it left no lasting impression on me. No Zara Tenerife shop is as nice as the one by the ocean in the Capital Santa Cruz. By the way, I don't think that any of the Zara shops are open on Sundays. Zara stores in Tenerife with their addresses and phone numbers where you also have a catalogue, impressions and even job offers for all over the world. Where shop for other things besides for clothes at Zara Tenerife? Please, go from Zara Tenerife to shopping in Tenerife where more insider tips are given.